This post is going to blow your mind! This was the day when my head exploded and I had a hard time digesting so much awesomeness. Yeah, that is a lot of hyperbole, but that's what I'm good for and this was in the top 20 days of my life. By the way, I'm several days behind, so I'm typing this a couple days after the fact. 1. Does it snow in Israel? Yes! It happened to snow on us as soon as we arrived back in Jerusalem from Galilee, where we had spent the last few days. There are massive elevation changes in Israel, so Jerusalem is way colder than the region of Galilee, much more mountainous, and thus more likely to snow. 2. Is this a Young Life trip? Yes, but not with high school folks. This is just the staff in the Houston region and some of out spouses. Two years ago our Regional Director decided to put this trip together and so for the past two years we have forgone some of our staff events, retreats and training times to divert all of that money towards this trip. A great investment. Of course, none of that would be possible without all of the wonderful folks who give their funds to make Young Life happen in Katy and all over Houston, so a big THANK YOU to all of you who are contributors to YL in Houston! With that said.....Here we go! First stop....Jericho, the oldest city in the world! Jericho was a city WAY before the time of Abraham and the earliest stuff in the Bible. Below is a picture of Jericho more or less how it looked in the time of Joshua, when the Israelites marched around it and then destroyed it. They were told never to rebuild it (even though they did briefly, but were wiped out for doing so) so it looks like it did around 1400 BC give or take a 100 years. Simply amazing. But wait there is more, scroll down past this picture. 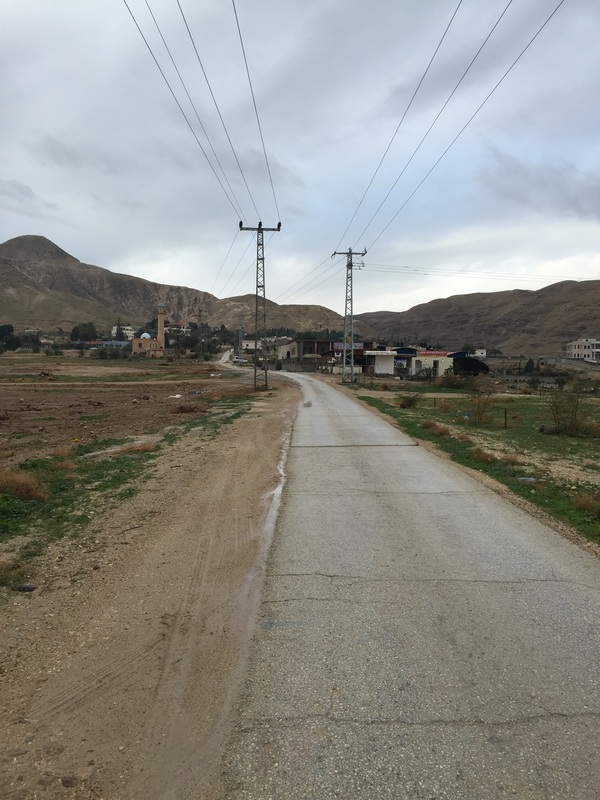 Jericho existed as a city for a long time before Joshua showed up to wipe it out. It even existed way before Abraham was alive. The picture below is from the lowest (and oldest) part of the city. This uncovered wall dates back to 7,000 years before the time of Jesus. So that is a 9,000 year old wall for those of you who don't like math. Holy smokes, some dudes built that wall 9,000 years ago! That blows away the 5,000 year old altar we saw a few days before. If that doesn't make your head explode, keep reading. We went over to this dumpy little road after we were at Jericho. This road is built over the Roman road that Jesus would have taken through New Jericho (different than the one from the Old Testament) on his way to Jerusalem. So this is road where Jesus would have met Zaccheus. This is the road that Zaccheus would have climbed into the tree to see Jesus and Jesus would have looked up and called his name, had dinner at his house, and changed his life. Jesus hung out with Zaccheus even though Zaccheus was a traitor and a cheat and everyone hated him, the result of Jesus reaching out to Zaccheus was a transformed life that in turn transformed many other lives when Zaccheus returned all the money he had stolen and all that people he cheated. Hard to digest it. If that is hard to digest, this next thing is like swallowing an atomic bomb, keep reading. Next stop was Bethany, where Jesus regularly hung out with his friends Mary, Martha and Lazarus. This sets the stage for John 11 the raising of Lazarus. If you aren't familiar with the story, Jesus gets word that Lazarus is sick while he is in another town, instead of coming to heal Lazarus he inexplicably waits. Lazarus dies, Jesus comes on the 4th day after he dies, so he is already super dead, and decomposing. New info we learned this week, Jesus had to wait until he was dead more than three days because that is when the Jewish people in the first century believed that spiritual and physical decay started after three days. So to make sure everyone knew that Jesus had the power over corruption and decay he had to wait. I've always wondered why Jesus waited so long and there is our answer! Fun fact, the location of Lazarus tomb is almost certainly where we think it is. Basically the idea that this was his tomb dates all the way to the first century, so we can be pretty darn certain that Lazarus climbed out of this hole! 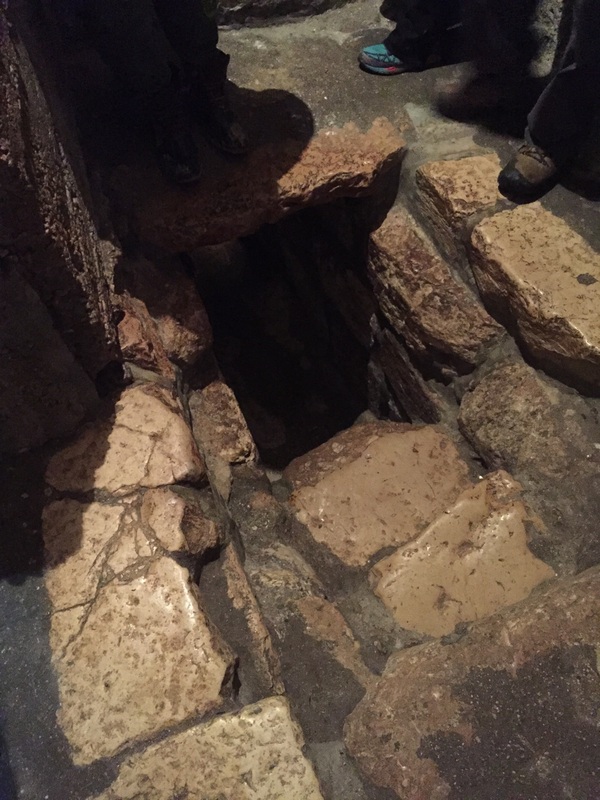 There is a church built over it now, so it's inside rather than outside, but this is the hole Lazarus climbed out of when Jesus called him back from death!!!!!!!! Behold below! Like I mentioned earlier we made it back to Jerusalem that night and it started snowing. Here is a pic of Jessica and I in front of the Dome of the Rock (Muslim site) that is built on top of where the Jewish Temple used to be. The western wall (place you always see Jewish people praying on TV) is just below that in the picture. Huge snowflakes. Magical evening. Too much to even try to digest while it was happening! I'm going to try to post again in a little bit to get caught up.